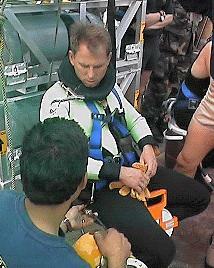 MDSU1 Chief Petty Officer Tom Lauersdorf goes over a pre-dive checklist with his support crew on Saturday morning. 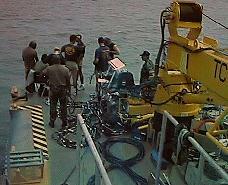 The Denbigh Project provided MDSU1 a training opportunity to document a wreck site near its drill station at Galveston. Members of MDSU1 work on the foredeck of U.S. Coast Guard Buoy Tender 643503, which was provided by the Aids to Navigation Team at Coast Guard Base Galveston. The buoy tender made for an excellent diving platform. Principal Investigator Arnold traveled to Galveston and relocated benchmarks at Fort Travis for GPS survey. Planning meeting in the evening. Initial familiarization dives on the wreck. Marked locations for several prospective trilateration stations. Diver support for GPS survey. One diver placed the bottom of the range rod on the spot to be surveyed, and one diver on the surface helped the boat crew hold the range rod vertical. Five locations on the wreck were surveyed providing X-Y-Z coordinates accurate to 1 cm. Also began measuring and drawing paddlewheel frames and complex machinery spaces between the paddlewheels. Noted that the bottom sediment was soft mud. Familiarization dives and mapping of features exposed above the bottom sediments continued. Facilitated press coverage by the Houston Chronicle and KBTX-TV Channel 3 in College Station. Mapping continued. Circle search of 30m area forward of boiler exhaust casing showed that there was no exposed wreckage in that area. Probing followed the starboard edge of the intact hull remains abaft the paddiewheel for 2-3m. Probing forward of the port paddlewheel was difficult due to jumbled wreckage in that area. The buried remains of the site are covered by about 0.5 m of soft mud. Drawing of profile views of all four paddlewheel frames completed. (Each paddlewheel had an inner and an outer frame that supported the paddles between them.) just less than half of each paddle wheel was exposed above the bottom. 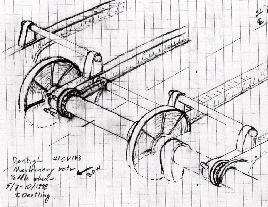 Tom Oertling made good progress on drawing the machinery between the paddlewheels. Drawings like these, made by divers, help to document the parts of Denbigh that remain exposed above the sand underwater. 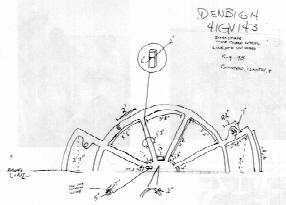 The oblique view at left, made by Denbigh Project co-investigator Tom Oertling, shows some of the machinery lying between the ship's paddlewheels; the drawing at right, by MDSU1 diver Timothy J. Goddard, shows what's left of one of Denbigh's iron paddlewheel frames. Compare this second drawing with the diagram of an intact feathering sidewheel. Equipment provided for the fieldwork included a survey grade Trimble Navigation GPS by Jack Howell of Easy Drive Instruments, Austin; vessels and diving gear of Detachment 111 of Mobile Diving and Salvage Unit One (MDSU1), U.S. Naval Reserve, Inshore Boat Unit One Four, U.S. 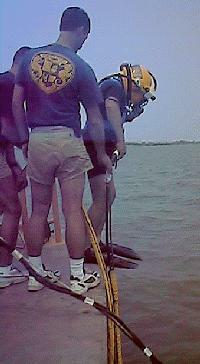 Naval Reserve, and the Aids to Navigation Team, U.S. Coast Guard Base Galveston. Additional boats and support were provided by Andrew Johnson, Doug Nowell and Winton Roberds of the Southwest Underwater Archaeological Society. Additional dive gear was loaned by Janice Roseberry and Warren Roseberry of Tom's Dive and Ski, Austin. The Aids to Navigation Team at U.S. Coast Guard Base Galveston provided U.S.C.G. Buoy Tender 643503 to serve as a dive platform and to support site survey operations. In addition, the team placed a block to secure a mooring buoy for future operations at the site. Inshore Boat Unit One Four, U.S. Naval Reserve. Inshore Boat Unit One Four provided small utility boats both as dive platforms and for transporting people and equipment between the Denbigh wreck site, the Bolivar Peninsula landing and Coast Guard Base Galveston. Finally, the biggest "thank-you" of all for this effort goes to the members of Detachment 111 of Mobile Diving and Salvage Unit One (MDSU1, or "Mud-zoo One") of the U.S. Naval Reserve. Nautical archaeological mapping is new to these folks, but they tackled it with both energy and attention to detail. This unit is deserving of the highest praise: they're "good people."